Welcome to the Granite City said the sign as you drive across the River Dee from the A90. Aberdeen. Home to Henry Cecil, Graeme Garden, Brewdog and Alex Salmond, winner of Britain in Bloom a record ten times and the 56th most habitable city in the world. That’s quite an introduction to a city that is often forgotten on the cultural map of Great Britain, one of the furthest outposts on the tourist trail of these wonderous Isles. The city’s history has been tied to the sea and it is no different today. The quayside still bustles with activity, day and night as the onshore home of the North Sea Oil and Gas industry. The importance of the sea in the development of the city can be found in the Maritime Museum, located in Shiprow which also offers some fine views across the harbour area and is free to enter. Another interesting museum in the city centre is the Tolbooth Museum which is one of Aberdeen’s oldest buildings and one of the best-preserved 17th century gaols in Scotland. It features displays on local history and the development of crime and punishment through the centuries and provides a unique experience in the form of its atmospheric 17th and 18th century cells, original doors and barred windows. For something more hands on and educational then head to the Science Museum in Tramsheds – admission is £5.75 for Adults and £4.50 for Kids. For those with a more criminal mind, you can follow the stories of crime writer Stuart MacBride who has used the city for the location of his Logan McRae thrillers such as Cold Granite and Dark Blood, with a self-guided tour around the places featured in his book. The city features a number of parks and gardens such as the Hazlehead Park and Duthie Park and Winter Gardens, whilst the fine beach of Balmedie is within touching distance of the city centre. A walk through Seaton Park down to Brig o’Balgownie, Scotland’s oldest bridge, is well worth the effort. Built on the orders of Robert the Bruce and restored in 1607, it served as the River Don’s main crossing point. Lord Byron, referred affectionately to the single span bridge in Don Juan. If you are prepared to travel out of the city a bit then the Queen’s favourite country retreat, Balmoral, is open between April and July, located around 50 miles west. Located just five miles outside the city centre is the state of the art home of the craft brewery craze. Brewdog can quite rightfully sit back and say “we did that” when they see the hundreds, if not thousands of micro-breweries opening up around the world today. The DogTap is located at the brewery and allows you to get up close and personal with the beer and the brewery process. Tours are available Monday to Friday at 4pm and 6pm, and 12pm, 2pm and 4pm at weekends and costs £15 per person, which of course includes a few beers. Number 67 & 68 buses run regularly from Aberdeen city centre to Ellon Park & Ride which is a short, thirst-inducing, walk away. They also have a bar in the centre of town in Gallowgate. The nightlife in Aberdeen is often something that people often come to the city for and there is so many bars to choose from that it is impossible to scratch the surface in one evening. The Howff in Union Street is one of the best rated bars as well as offering some decent food, whilst literally just down the road is The Pint of Cupid which is certainly a fixture on most nights out. The Tippling House in Belmont Street gets very busy in the night as it offers an extensive food menu and whisky tasting. Finally, The Illicit Still in Guestrow offers food, drink, pool and a good location. I actually had my first ever Deep Fried Mars Bar back in 1999 in Stonehaven in The Carron Fish Bar, which used to proudly display a banner on the side of the building claiming they invented the snack, although today they’ve been forced to remove the claim. However, there are still places around the city where you can try the “delicacy”. 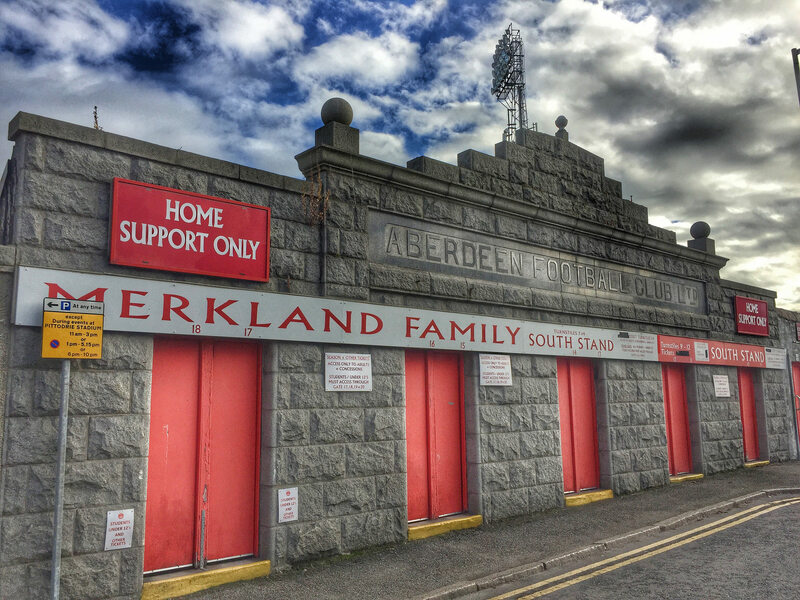 Alternative, for a real unique snack, head to Pittordrie, home of Aberdeen Football Club where you can sample the Pittordrie Pie, so good that the football club are looking at trademarking the meat pie. There are a number of good hotel options in the city, with the majority falling into the “reasonable” bucket. Jurys Inn Aberdeen is right in the centre of the action, opposite the station and has the airport bus stop right outside, whislt the Premier Inn Aberdeen City Centre Hotel is just north of Union Street, in the heart of the main night time action. Holiday Inn Express Aberdeen City Centre is also in the area and good value if booked in advance. If you really want to push the boat out then consider the Mecure Ardoe Hotel in South Deeside Road which looks like a Disney-esque castle. Aberdeen’s Dyce Airport is located six miles northwest of the city centre and is served by BA from Heathrow, Easyjet from London Gatwick and Stansted, as well as FlyBe from London City. The airport is linked to nearby Dyce railway station by the 80 Dyce Airlink shuttle bus which runs between the station, where you can get a train every 30 minutes to the city centre. Trains run on a regular basis up the east coast from Glasgow and Edinburgh via Dundee.